1. Be proud of yourself: Just look at yourself, you are a wonderful husband, father and a good worker. You have a comfortable home of your own and a car to drive around. Just count all your blessings and be grateful to God for what you have. 2. Appreciate yourself: Identify your strengths. Find out the things that you can do well and do better than others. Think about the appreciation shown to you at your workplace by your boss for your contributions. 3. Don’t torture yourself. In the past you might have done wrong, committed serious mistakes or made wrong moves. Don’t dwell on it, don’t; blame yourself. There is nothing you can do about it. Forgive yourself and let life go on. Allow yourself to begin anew and do things better by avoiding the mistakes in the past. 5. Self acceptance; Accept yourself as what you are with your strengths and weaknesses. Don't worry about what others think about you but how you feel about yourself. Self love means self-confidence and you also make an effort to improve yourself for the better. 6. Positive emotions: Replace all your negative emotions with positive ones; be happy, be energetic, be creative, be cheerful and be satisfied with life. When you love yourself, you look at life on the bright side. Your energy level goes up and you enjoy better health. Your self love sends vibrations to attract things you desire in life. Working life is stressful. To minimize workload and to streamline your work, employ these 5 great tools to simplify your working life. 1. Year planner: This is a tool to help you to identify the goals of the company and outline the analysis, strategies and planning required to achieve these goals. The year planner gives you an overview of the tasks one year ahead of you. By looking at the planner you will stay focus while you do your day-to-day planning. 2. Follow-up file or tickler file: This is a file which is divided into 2 parts, one part is divided into 31 sections for each day of the month and another part has 12 sections for each month in a year. Using the year planner as a guide you can slot all the information into their respective months and those tasks for the current month into their respective dates. At any time any new assignments or dates to remember can be quickly kept in a specific month or a specific date in the current month. Most important of all, make it a habit to look at the file first thing in the morning to know the tasks for the day. As soon as the tasks for the day are done it should be transferred back to the appropriate month to be used again next year. At the end of each month remember to transfer the documents for the following month to the current month into their specific dates. 3. Daily to-do list: By looking at your reminder file you know what you have to do for the day and other items in the to-do list that you have written in the previous day. The to-do list helps you to focus on the few important tasks you need to do for the day. 4. Checklist: When you have a checklist in place nothing is left out. Again, you don’t have to resort to your memory. As an example a checklist for annual external audit will assist you to have all the documents ready for the audit. 5. Memo pads. You should carry one in your pocket to record ideas suddenly occur in your mind and also things to do later. Another memo pad should be at the telephone set to take down messages and act on it later when you are busy doing something else. The take-home message of using all the tools is that you should not use your memory to remember all those things you need to do. Avoid clutter in your mind. An efficient and effective system will simplify your working life and you get things done with the help of all these tools. Instead, use your mind to imagine, create and come out with great ideas. 3. Relationships: It is between husband and wife. It is between parents and their children. It is also among friends, relatives, neighbors and co-workers. Are you getting along well with others in your particular role? Success in life is very much depended on the relationships with people that you come into contact. 4. Financial freedom: It is actually a by-product of the idea created by you. Your idea, which is useful, brings success to others and in turn they bring wealth to you. The outcome is that you enjoy financial independence. 5. Happiness: Yes, good health, a cordial relationship with others and personal wealth do bring happiness to you. However it is the happiness from within your inner self that gives you lasting happiness and peace of mind. You can lose your material possession but you still can make up your mind to be happy. You can be happy to enjoy with what you have and to live in the moment to discover more happiness in life. These important things in life are woven together; you can’t have one without the others. When you take good care of your health, it facilitates the creation of great ideas. You need the cooperation of others to materialize your idea. You serve the community well and in turn you get more out of life to create wealth. Life is beautiful when you always make up your mind to be happy. This article is dedicated to Henry Zaini from Indonesia who inspired me to write this post. Calculate your body mass index (BMI), waist-to-hip and percentage of body fat. Change the way you live to a healthier and happier lifestyle. To win the favor of your boss, you have to make him feel good about you. Be professional: You are hired because of your area of expertise. You are expected to offer your expert opinions. The right way to go about it is to be sincere and honest. Let your boss look at the full picture so that he can make wise decisions with your valued input. Do not just show the advantages but the disadvantages as well in every issue. Say it when you have to: You don’t have to talk often to your boss, but when an issue needs to be addressed; your boss should be highlighted and alerted promptly. Be respectful: Your boss may be nice to you but the normal courtesy and respect for your boss should always be there. It is more so when he is with other people. Ask, don’t assume: The worst thing you can do in any work place is to assume things. When you are not sure, ask. The same applies when you deal with your boss. Understand the message perfectly from your boss before execution to avoid disaster. Do more: Do not confine to your area of work. When you can get other things done, just do it. Your initiative will be appreciated. Proactive: Know in advance what is expected of you, do it and deliver on a timely fashion. Know when to see him and how he wants to be reported - in writing or just orally. Organize yourself and plan you work in such a way to suit his requirements. Whenever there is a problem go to him with your recommended solutions. Be positive: Dress smartly, be cheerful and look at things on the bright side.The boss may not be in a good mood, it does not mean that there is something wrong with you. Your positive outlook will inspire others as well as your boss. Getting along with your boss is just like getting along with every one else. Bring out the best in him so that he will see the best in you. Educate your child: Encourage him to ask questions about people he meets online especially when he is uncomfortable about things he has encountered. Importance of offline activities: It is important that your child meet up with friends to socialize and take time to exercise because Internet is not everything in life. Personal contact with people met online: Meeting people contacted online or invitation to your house is a no-no because they may not be what they claimed to be. It is very risky. Your child to tell you places that he has been on the Net: Instruct your child to keep you posted about sites that he has visited. This will allow you to monitor and discuss with your child the suitability of the sites. Keep your password to yourself: Do not share your password with others. This is to avoid malicious intentions of other people using your password. Monitor your child’s online activities: You can review the History list of web browsers to find out the places that your child has visited online. Communicate with people you know: Encourage your child to connect online only with people he knows in person. Cyber-bullying: The National Crime Prevention Council’s definition of cyber-bullying is “when the Internet, cell phones or other devices are used to send or post text or images intended to hurt or embarrass another person.” Inform your child that if he has been cyber-bullied he should inform you immediately. Taking necessary precautions means surfing on the Net is safe, fun and enjoyable. 2. Be happy: When you get up in the morning, do a broad smile in front of the mirror. You are greeted with a broad smile in return and it is the best way to start a new day because it makes you feel good. Crack a joke with friends and laugh out loud to lift your cheerful mood further. Be happy and generate other positive emotions like enthusiasm, confidence, appreciation and love. When you are feeling down consume chocolate to make you happy because it releases endorphins. 3. Avoid the sun: The above pictures tell the full story. 5. Exercise: When you can walk from here to there, don’t drive or take the lift. Jog or cycle every day to sweat it out. 6. Be connected: You don’t have to keep things in your heart. Let it out, tell your friends. You will feel better. 7. Peace of mind: Avoid negative emotions like jealousy, hatred, vengeance or resentment. How to have a peaceful mind when you mind is filled with negative thoughts? Learn to relax by taking up Yoga or Tai Chi. 8. Stop smoking: Smoking is not only bad for health; the habit will accelerate your aging much faster. 9. Use your brain: Mental activities will also extend your youthfulness much longer. Play Scrabble and other word games to stimulate your mind. Lean something new like blogging to sustain your alertness and curiosity. 10. Live in the moment: Don’t dwell on your failures in the past and don’t worry about the future. Live in the moment, be mindful of what you are doing, focus you mind to live the moment and enjoy life. From the above list you will note that when you do the right things, behave positively and eat the right kinds of food you can be youthful much longer. Do you work long hours? Are you able to concentrate for such long hours and be productive at the same time? Are you meeting your daily goals? Have you neglected your health and your family for the sake of working long hours? Here are five tips to meet your career goals and maintain a balanced lifestyle. 1. To-do list: Having a list of the things to do for the day will help you to be productive by attending to those tasks that are important and result-oriented. You avoid stress when you have organized yourself to work smoothly. 2. Do not work longer than necessary: Working long hours does not mean that you are productive. It is possible that you are unable to organize yourself to be efficient and effective. The most important thing is to focus and accomplished the most important jobs for the day and ignore other minor issues. The only exception to do overtime is to produce an urgent report requested by HQ in the last minute. 3. Your goals: Your daily to-do list is closely linked to your long-ranch goals. Your goals give you the direction in life. When you have achieved your daily objectives, you are a step closer to your long-term goals. You goals give you the meaning in life because they are your dreams and aspirations. 4. Your family: You just can’t work long hours and thinking that your spouse and your children will be able to take care of themselves. Your family needs your tender care and love too. They are humans. Just remember that when you have a happy family you will also be happy at work. The fact is that a balanced life is the right way to live our life. Spending too much time on one aspect of your life will be detrimental to the other segments of your life. By the same token too much of a good thing in life is also counter- productive. Wish you a happy and a balanced life. 1. 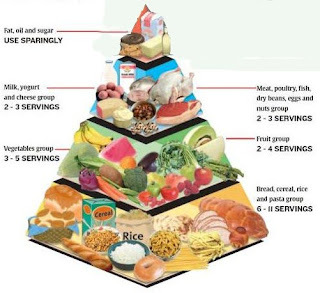 A balanced diet: A balanced diet consists of carbohydrate (breads, beans, potatoes, bran, rice and cereals), protein (fish, poultry, beans, and nuts), fat (olive oil, peanut oil, canola oil and salmon), vitamins (fruits and vegetables), minerals (milk, cheese and yogurt), and fiber (whole fruits and vegetables) in the right proportion. Drink plenty of water daily to keep your body hydrated. Sit down and eat your food slowly. Chew each mouthful. Eating less but more frequently at regular intervals is the best way to burn calories. You train your body to expect food to burn every few hours. You are eating more frequently but you do not put on weight. Take a dietary supplement such as a multimineral-multivitamin to cover deficiency. Sleep: When you are deprived of sleep, it may cause weight gain, irritable mood and lower your immune functions. To have a good night’s sleep, clear your mind of clutter, be calm, and write down things you need to do the next day. Free your mind from anxiety and worries. Relaxation: When you are able to unwind, you relax not only your body; you relax your mind as well. Tai Chi and Yoga are beneficial forms of meditation. They give you mental and spiritual well-being. Listen to classical music to sooth your tired mind. Play a musical instrument or enjoy reading a motivational book. Do what you are interested to relax yourself. Exercise: The three S’s for total physical fitness are stamina, strength and suppleness. Total fitness allows you go further, work harder and more flexible. You can jog to build up your stamina. You do weight training to improve your strength and you do stretching to make yourself more flexible. Positive emotions: Be happy, be confident, be enthusiastic, be calm, be focus, be cheerful and fill your heart with love. Just think of how negative emotions such as fear, hatred, vengeance and jealousy impact your health, your mood and your behavior. Your mind is restless, your heart is racing and you are disturbed. Total health and fitness will allow you to work harder, play harder and enjoy life more fully. You can raise smart children by your attentiveness to your kids and your good habits. Your children will learn more from what you do than what you say. 1. Love: Love your child because he is your child and not because he is talented or the best student in the class. Your love will give your child the necessary assurance, acceptance and approval. Psychologically, he will feel that he is safe, been loved and cared for. 3. Help: Help your child with his homework He will turn to you when the need arises. Your child will find support in you and you feel proud of yourself because you are more than parents to him. 4. Spend time with your child: Happiness for your child is spending quality time with him. Go for a walk in the park or window shopping at the mall. When you are close to your child, he will find it easy to talk to you and will not hesitate to ask for help when he has a problem. 6. A love for books: I like to read whenever I am free. My reading habit is noticed by my children and they follow my habit. When we go to the mall, Popular Book Store is our first stop and, more often than not, it is our last stop as well. A love for books is the most useful habit that your child can acquire in his whole life. Books are sources of knowledge, wisdom and motivation for your child. Spending more time on reading books means spending less time on TV for your child. 7. Motivation: You don’t have to be a teacher or a tutor to motivate your child. What your child needs from you are your kind and caring words. When he is about to sit for an examination just tell him to do carefully and do his best. Your child will be motivated and he is not under pressure. Words of encouragement work wonder for your child. Praise him for his effort in getting good results. You send a clear signal that hard work is essential to success. Encourage your child to be better in his own performance and not by competing with others. A happy home environment is vital for a healthy growth in your child so that he will be happy, smart, responsible, obedient and self-assured. We are now in the last quarter of 2009 and you know New Year is around the corner. This is the best time to identify areas in your life that your need to improve and do a New Year’s resolutions. Do not wait until the last minute to do it haphazardly. It will defeat your purposes. Here are a few pointers to help you make your New Year’s resolutions meaningful and achievable. 1. Commitment: Find out the things that you want to do and achieve. It should be a part of your lifetime goals. It should be important and meaningful to you. As every one else is doing resolutions, the external motivation and your desire to succeed will make it easier to reach your objectives. 3. Take your time: Don’t do it in a rush: Get it done in a quiet room on a Sunday evening to find out your passion and interest. You can only sustain your resolutions for those things that you are interested. Review and revise the resolutions on another day. 4. Be reasonable: Don’t set your goals too high or committed to too many things. Pick only one thing that means a lot to you and you can focus on it. Which area of your life you want to focus on – health, career, money, family, relationships, attitude or education? 5. Put in writing: To show your commitment and as a constant reminder to yourself, pin the New Year’s resolutions at your desk so that is visible to you all the time. 6. Action plan: It is good to start early to do your New Year’s resolutions so that you can carefully map out an action plan. 7. Monitor your progress: Rejoice when you are progressing according to your action plan. However, make changes to your plan as and when situation changes, be flexible. Happiness is a wonderful and delightful thing. It is not about the material things that you possess or the amount of money you have in your bank account. It is evidenced by the fact that some of the poorer countries in the world are the happiest people in the world. There is a way to be happy that I would like to share with you. You must have heard of positive mental attitude. The same thing can be applied to happiness. I have found out that in order to be happy all you need to do is just by telling yourself ’’I am happy” repeatedly. This will trigger you mind to generate thoughts of happiness. From the moment you wake up in the morning until you go to bed this happiness feeling will linger throughout the whole day while you are driving, eating, working, talking or not doing anything at all. As you know there are times in your life that your mood is low. It is very normal. We can’t be happy all the time. Whenever your spirits are low just accept it and don’t try to do anything at all. Our life, just like the river or the sea you will witness high tides and low tides all the time. Allow the low tides in you life to go by as they are. Apart from the low periods in your life, you should always generate happiness from within. After all, time passes by swiftly and life is short and unpredictable, while you are alive and living in the moment, why not be happy? Why tell yourself to be miserable when you can be happy? The choice is yours. Be alive and be happy!